At Paul Rhodes Bakery we like to run a very open, transparent business so we regularly invite customers to come down to Greenwich to see us. These visits give us a great opportunity to show how very proud we are of the team and our impressive operation, while allowing the customer to see what it really takes to meet their needs. As a matter of course, visitors quickly get kitted out in a white coat, hairnet and shoe covers and we give them the grand tour so that they can see the whole process – starting from sacks of flour in the store room to packing fresh loaves for delivery and getting them out of the door. Afterwards there is of always a chance to taste a large selection of products, many of which our guests have just witnessed being made. What always strikes me when we do this is the amazement at just how big and busy we are – while still being a hands-on and handcrafted operation – as well as the fact that we run 24/7 virtually every day of the year. The media image of a baker rising just a few hours before everyone else, baking their goods and then getting everything to people in time for breakfast – and then maybe going back to bed – has a lot to answer for. We do of course get our products to people in good time but it’s part of a continuous cycle of first ordering by 2pm and then baking, done in shifts by dedicated bakers, supported by a team of packers, drivers, cleaners and administrative staff, all coming together to make sure that each croissant, or fresh slice of toast, is on the plate for breakfast…and of course, other occasions throughout the day. When I started out, and was virtually a one-man-band, my favourite part of the day was driving through the empty streets of London as the sun was rising and dropping my products off to my first customers such as Tate Britain. It was just brilliant having the streets to myself and ending my day in this way. Now, with our scale and things running 24/7, I think my favourite time is the start of a shift in the bakery. It’s all about the anticipation of the hours ahead – I suppose it’s a bit like a team getting ready for a match: you put on clean whites, you meet with the team to discuss tactics and what outcomes are needed, everyone gets fired up, along with the ovens, and then it’s off to work. On an average day last month we had more than 40,000 units being produced across a 600-strong product range, plus bespoke orders – everything from fine dining rolls and macarons to large cakes and 1600g loaves. At key times such as Christmas this can increase to well over 50,000 daily units. In order to produce this range we have many different mixes and recipes to prepare. And, as we don’t just stand there and push buttons, we have to have highly trained bakers who understand the importance of planning and precision at every single stage…from mixing and shaping to proving and baking. The Art of Baking is our new company strapline and it’s no accident. We take flour (and a few other ingredients) and turn it into golden, delicious breads and pastries, in the way that an artist will turn a palette of paints into a stunning picture. But for us, the more artistic skills of touch, sight and sound – which are all vitally important at various stages – also have to be coupled with physical strength and fitness. Being a baker is hard work and lifting sacks of flour, getting dough out of mixers, hand shaping for hours on end or removing breads from the oven on a traditional baker’s peel, attached to four metre pole, is not for the feint-hearted. And of course, when you are working with the ovens, it can be very hot, especially in the summer. It is exhausting but the wonderful smells, coupled with the sight of golden, perfectly crusted loaves, or delicious, uniform pastries all cooling down is very satisfying. And for dedicated bakers, it’s a feeling that never fades. Given the anti-social hours and the physical work, I do often think of baking as a calling, or vocation – and thank goodness there are people out there, other than me, who want to be bakers: none of us would want to be without our daily fresh bread. I am very proud of my 120-strong team and what they achieve every single day of the year. 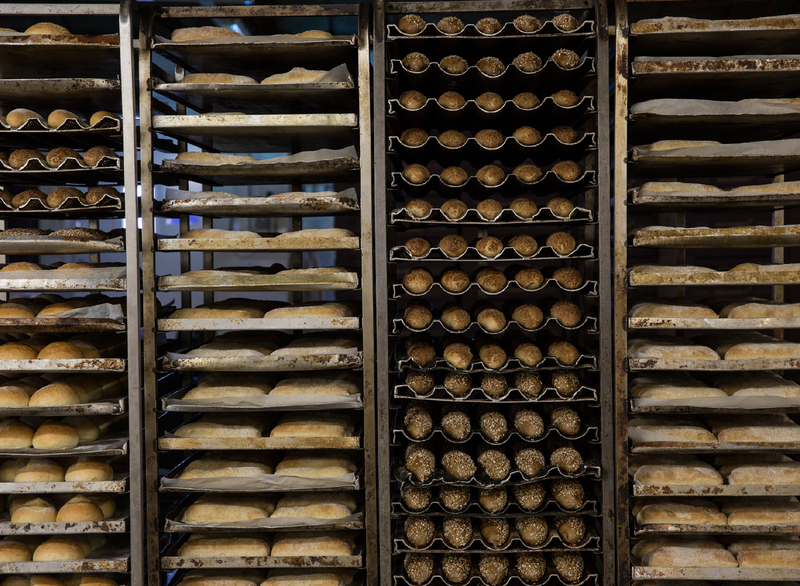 The bakery is a massive team effort and while we have a highly complex operation, we also delight in producing for the most part relatively simple yet delicious handcrafted products, all made from the finest ingredients. If you are a customer and haven’t yet been able to visit us – but would like to do so – please let me know. We would love to welcome you to Greenwich to meet the team and witness the Art of Baking. October 2nd-8th is National Cake Week – to help celebrate, here’s a lovely recipe for mum’s old-fashioned apple upside-down cake. Enjoy! 1. Melt the 1/3 cup butter in a large non-stick sauté pan. 2. Add the sugar, water and cinnamon. Cook over medium heat until the mixture gets foamy, then add the apples. 3. Cook the apples in the cinnamon and sugar syrup just until they begin to soften. 4. Transfer the apple slices to the prepared pan and pour the syrup from the pan over them. 1. Preheat oven to 350 degrees F. Grease a 9×9 inch baking pan or a 10 inch round cake pan well. 4. Beat in the vanilla extract. 6. Add the dry ingredients alternately with the milk, beginning and ending with the dry ingredients. In general, I add the dry ingredients in 3 portions and the milk in 2 additions. 7. Dollop the batter by heaping tablespoonfuls all over the surface of the apple layer and then spread out evenly to the edges of the pan. 8. Bake at 350 degrees F for about 40 to 45 minutes or until a toothpick inserted in centre comes out clean. 9. The toothpick test is the best way to ensure that this cake is fully baked.